Halloween is upon us! So maybe you’ve had time to hand-sew that perfect ninja or princess costume, or you’ve already headed to the Halloween pop-up shop, or maybe, life has gotten in the way or your child who didn’t want any form of a costume has now changed his mind! The bottom line: it’s time to weave some parent magic and create monsters, dinosaurs, and cupcakes where there was none, so scour your closets and get out the glue. Here are 10 simple last minute costume ideas that you can put together quickly and easily. 1. Hideous Monster: Take a few ping-pong balls or cotton balls, color some eyes in (perhaps add red or yellow for effect), then hot glue them to a baggy sweater. You can add other bits and pieces to the sweater, letting your imagination run wild. 2. Spider: Transform into a spider with black clothes! For the legs, just use three pairs of pantyhose, which you can either leave as is or add stuffing. You could even add wire (from a hanger) to make them stiff. Then, take string, so you can connect all of the legs together. This way the legs will all work together when you move them. 3. Ladybug: Look for black paper or black fabric that you can cut into small circles and then glue, sew, oreven staple to red clothing. Look for a red or black headband that you can then stick some black pipe cleaners to and voila! Antennae! 4. Tourist: Time to look for your tackiest pair of shorts, highest socks, and oldest frumpy t-shirt. 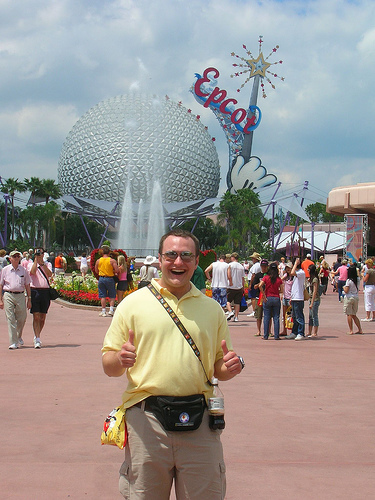 Add a fanny pack or backpack, camera, water bottle, sunhat, sunglasses, and a map, and you’re a tourist. 5. Operation: Have fun creating an old-style Operation costume. Google the operation game and check out each body part. Older kids can make the pieces themselves while younger kids can help color them in. A little construction paper can go a long way here. 6. Grapes: Get a bunch of purple or green balloons, blow them up, then stick them on your clothes. You can just throw on a green accessory for the leaves, or draw and cut out leaves from regular paper. 7. Medusa: Head to your nearest toy store to stock up on rubber snakes and worms of different sizes. Gummy worms will also do. A few bobby pins will help them stick in your hair. Put on some dramatic eye make-up, and turn into the monstrous Medusa. 8. Cardboard Box Dinosaur: Head to the recycling and grab your old boxes. First, you need a small box for the head, a box for the upper body, one for the lower body, and something for the tail. Improvise arms and jaw with paper and toilet rolls. Make sure you’ve got tape, then let your imagination run wild. Certainly some paint or marker on the outside could also spruce up your dinosaur. 9. Cute Cupcake Costume: Head over to your local Dollar Tree and get some cardstock poster paper and a small round laundry basket. Then, hit the local fabric store and pick up some tulle. You can fold the poster paper accordion style and hot glue it to the laundry basket. Cut the tulle into strips and tie it into the laundry basket, so it won’t fall out. Leave some space for arms, and you’ve got it set. You could use the tulle to loop over the shoulders or some other form of strap to keep the costume in place. 10. Cutest Cow Costume: Look for the hat, boots, and clothing at a thrift store or maybe in your own closet! Acrylic paint can be used to paint large cow spots on a white shirt and leggings. Aside from paint, the only other bit you might need to buy is felt. Cut out ears and horns, then glue them to the hat. Add a rope tail and use some eyebrow pencil for the nose and you’re set! Many of us have great Halloween memories from childhood: creative costumes we invented or bought, epic journeys to get the best candy, incredible costume parties we went to. What a joy! It’s time to let your children experience the same, but not at the cost of your sanity. These simple costume ideas are designed to help you also enjoy Halloween. And if all else fails, why not try some mash-up costumes concocted from previous years? The results could be pretty funny . . . or sometimes just scary. But isn’t that the idea? Boo!